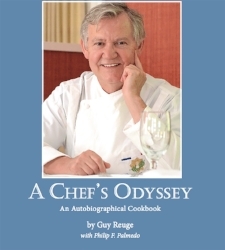 A Chef's Odyssey: An Autobiographical Cookbook, by Guy Reuge with Philip F. Palmedo. The Wines of Long Island: Birth of a Region, with Edward Beltrami, Photographs by Sarah Matthews, Preface by Paul Pontalier. Waterline Books, 1993. Second edition, 2000. The third edition is in the works. “Non-Sculpture; On the Origins of Aesthetic Instincts” Leonardo. Objects designed with purely practical purposes in mind, such as jet engine blades, are widely recognized as beautiful. This essay follows the implications of this, and the “beauty” of mathematical equations, back to the origins of our aesthetic instincts. An appreciation for mathematical relationships and physical phenomena such as balance, it argues, had survival and preferential mating value. This reasoning supports the argument that our aesthetic tastes are built into our genes and that art is a fundamental part of what makes us human.